Is repeating baby talk back to your child bad for speech development? Is repeating your toddler’s cute speech mistakes bad for her development? Earlier this week, I took a video of my 2-year-old asking me for a chicken nugget. It’s prize-worthy, that three-second shot, and not just because she spouts out bits of half-chewed poultry as she says it. If you’re a parent, you know: The more ridiculous a toddler’s pronunciation, the cuter it is. I want to preserve that chicken nunnet in Tupperware forever. Which is why, if I’m honest, I sometimes reinforce my daughter’s speech mistakes. I ask if she wants gogurt—yogurt—because I kind of want her to keep saying it wrong. A biologist friend of mine used to work squid into random conversations with her toddler just to hear his attempt at tentacle—testincle—and three families I know have permanently replaced the word watermelon with waterlemon in family conversations because of their children’s gaffes. Is this bad of us? 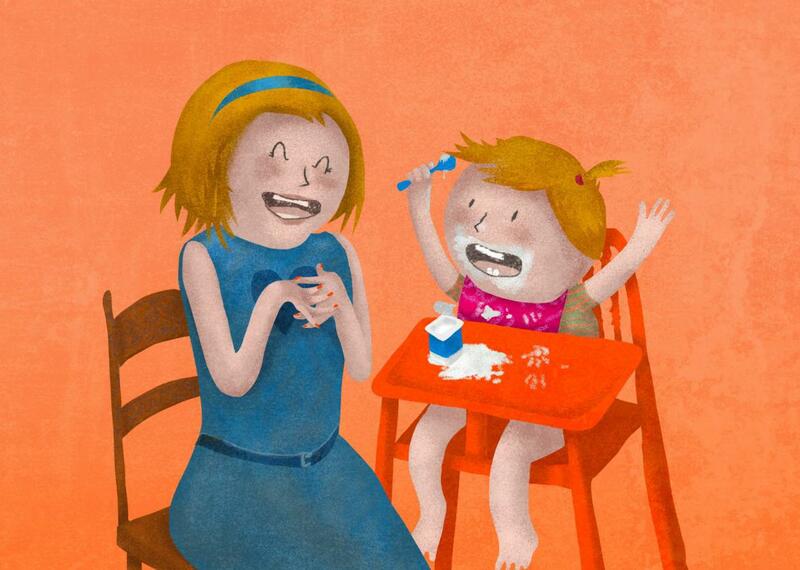 Is it counterproductive to revel in—even encourage—our toddlers’ language mistakes? At what point, if ever, should we correct these bloopers or worry that they are signs of a problem? Thankfully, most of the time, a kid’s language and speech mistakes aren’t anything to fret about. Talking is hard, so kids are going to slip up while they work out how to make the right sounds. Grandma becomes gamma, bathing suit is babing suit, yellow comes out lellow. When I asked Diane Paul, the director of clinical issues in speech-language pathology at the American Speech-Language-Hearing Association, whether it’s bad for parents to mimic toddlerspeak for fun, she reassured me it’s not, as long as we don’t do it all the time. “A child is not going to develop a speech and language problem because you occasionally say baba instead of bottle,” she says. Grammar is insanely difficult, too. In fact, it’s amazing that kids don’t make more blunders than they do. As an example, psychologist and linguist Steven Pinker explains in his book The Language Instinct that the auxiliary verbs—which include words like can, should, must, be, have, and do—have about 24 quintillion logically possible combinations. Only 100 of them are grammatically correct. Yet for the most part, kids get them right. As part of her 1990 MIT dissertation, Rutgers University psychologist Karin Stromswold analyzed the speech of 13 preschoolers, and “although most of the logically possible combinations of auxiliaries and inflections are unacceptable, and each of the children’s 200,000 lines of transcripts presented an opportunity to make such errors,” she wrote, “I found very few examples of illicit combinations.” That’s astounding. Many of the grammar mistakes kids make are logical, too. Consider the irregular verbs, like eat, whose past tense is ate. These forms have to be memorized, a process that can take children years. In the meantime, when a child wants to change a verb from present to past tense, he’ll likely apply the grammar rules he has learned for regular verbs, which involve adding -ed to the end. Thus you often hear kids say, “I eated the whole banana,” which grates but is a perfectly rational construction. Sometimes, their logic is a little less obvious. A few days ago, my daughter complained that her toe hurt. I asked, “You’re OK?” and she replied, “My OK!” It seemed like an odd mistake until I realized that you’re is a homophone for your. Perhaps she had misinterpreted my question as “your OK?” calculated that OK was something to be possessed, and replied appropriately. Smart girl! Some mistakes are, of course, signs that your child might need extra language help, but it can be hard to tell because the range of normalcy is pretty vast. My son probably spoke 10 times more words at 18 months than my daughter did, but both kids, I’ve been assured, are perfectly normal. Paul points to certain red flags that parents can look out for—for instance, if a 4- to 6-month-old baby doesn’t smile or babble, or if she doesn’t speak at least one or two words by her first birthday, or if she doesn’t string words together to make short sentences by age 2. Signs of possible speech problems include if a 1- to 2-year-old is having trouble pronouncing the easier-to-say consonants P, B, M and H, or if a 2- to 3-year-old is still having trouble with K, G, F, T or D. That said, even kids as old as 4 or 5 may still struggle with one or two tricky sounds: R, S, L, and consonant blends like br and sp can be tough. My 5-year-old still says bekfast. If you do decide to get your child evaluated—and Paul says that there’s really no downside to doing so if you have concerns—your local school district should do it for free as part of the Child Find project, an offshoot of the 2004 Individuals With Disabilities Education Act. (Contact your district for more details.) If your child qualifies for services, he can get treatment for free, too, sometimes at home. You can also seek out a private speech-language pathologist, but health insurance coverage for such services varies widely. It can also help to speak to your infant or young toddler in “parentese”—a common form of baby-directed speech used by mothers (but not so much by fathers) that involves speaking slowly and exaggerating differences between sounds. In a 2014 study, researchers at the University of Connecticut and the University of Washington had 11- and 14-month-olds wear miniature voice recorders for four days. They found that the babies whose parents spoke to them using parentese had learned more than twice as many words a year later than the babies whose parents did not speak to them this way very often. That said, parentese is not required for language acquisition either. Some cultures don’t do it, and kids learn how to talk just fine. Bottom line is this: Language is hard, and your kids will need ample time to master it. Don’t ignore red flags, but don’t stress if they have age-appropriate trouble. Talk to them a lot and enjoy their cutest mistakes. Because, unfortunately for everyone, they won’t be saying testincle forever.